Langhorne: It’s a sea of pink in the home stands for “Pink-Out” night as Neshaminy hosts legendary Vince Bedesem and a very talented Golden Hawks team. Both teams are at 5-3 and the stakes are set high with play-off implications. The ‘Skins won the toss and elected to keep the ball. QB Brody McAndrew and his offense marched down the field methodically eating up yards for 8 minutes. Sophomore running back Chris James was able to run the ball 29 yards through the Hawks’ defensive line and Cory Joyce and Logan Williamson gained 16 and 11 yards respectively. Then at 4:06 with the ‘Skins on the Hawks’ 5 yard line Brody threw a sweet little pass to Ryan O’Connor for a TD. Jack Hughes’s kick was tipped by the Hawks and the score was ‘Skins 6 – Hawks 0. The drive saw Neshaminy convert three straight 4th downs to score. The rest of the first half was scoreless. The Hawks were able to move the ball in the second half using their running game but the ‘Skins’ Luke Hitchen stopped a turnover on downs on their 11 yard line. Although the ‘Skins could not score, the highlight of the 2nd half was a near impossible 41 yard catch by Ryan O’Connor. Score going into half time is ‘Skins 6 – Hawks 0. Back on the field following a 55 yard kick by ‘Skins’ Jack Hughes, the Hawks went 3 and out followed by the same from the ‘Skins. Deep in our territory the ‘Skins’ punt was blocked and the Hawks recovered it on the 10 yard line. From there the Hawk gained 5 yards on 2 Patterson runs. A Noah Caldani throw to Nazhir Troutman was interrupted by Logan Williamson and the Hawks elected to go for it on 4th down. However, Caldani made contact with Nick Gallo too far short of the end zone due to a timely tackle by Cory Joyce. With the ‘Skins now in possession all the way back in their own territory, several runs by James and a catch by Joyce brought them forward 28 yards. Quick thinking on the part of James Stetson III who recovered a fumble got the ‘Skins another 1st down. James then picked up 22 yards in a big run and teams switched sides as the 3rd quarter ended with the score still at ‘Skins 9 – Hawks 0. The ‘Skins stalled on their 14 yard line as the 4th quarter began. Going for it on 4th down, the Hawks defense stopped Oleh “The Iceman” Manzyk when he was mobbed by a gang of Hawks’ defensemen. The Hawks took over but Bobby Buchys’ rush on Caldani forced a throw which was intercepted by Cory Joyce. Now on their own 10 yard line the ‘Skins managed to get to the 7 and elected to go for a field goal which Hughes completed for 3 more. Score was now ‘Skins 9 – Hawks 0. The Hawks then turned the ball over to the ‘Skins on 4th down at their own 43 yard line. After a gain of 10 yards, the ‘Skins fumble and the ball goes right back to the Hawks with 3 minutes left in the game. Then Manzyk pushed right through the line and sacked Caldani for a 20 yard loss. On 2nd down and 20 to go Caldani found Nick Gallo at the 49. Caldani brought it another 11 yards into ‘Skins territory for a first down only to be sacked by Chisom Ifeanyi 2 plays later. With 12 yard to go on 3rd down both Luke Hitchens and Chisom Ifeanyi stepped up for a big sack. Now 4th and 18 yards to go, Hitchen again forces Caldani into an incomplete hurry up throw and the ball is turned over on 4th down to the 'Skins. With 1:28 left on the clock the ‘Skins took a knee and let the clock run out. Final score ‘Skins 9 – Hawks 0. Thank you to Coach Bedesem and his Golden Hawks who played hard all four quarters and a big shout out to both defenses. The ‘Skins put together a real team effort tonight. Next week we are at home for Senior Night against our neighbor the Pennsbury Falcons. With a rivalry going back to 1930 it draws a big crowd every year so be sure to be at Harry’s House early to get a good seat. Captains for tonight’s game: #5 Oleh Manzyk, #12 Brody McAndrew, #25 Cory Joyce and #88 Bobby Buchys accompanied by a few of the Mustangs from the Challenger program. 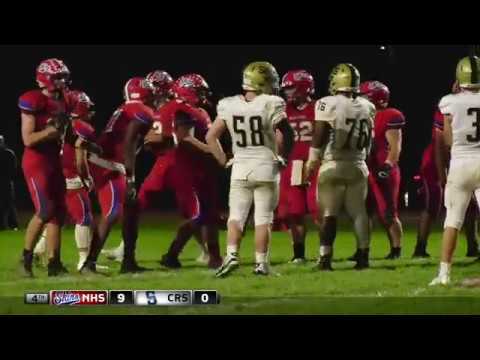 Defense First star: Neshaminy defensive line (DE #32 Luke Hitchen, DT #88 Bobby Buchys, DT #00 Sean Smith & DE #6 Chisom Ifeanyi) – The Redskins’ defensive line set the tone in Neshaminy’s 9-0 shutout win over Council Rock South, limiting the Golden Hawks’ ground game – led by senior standout Chase Patterson - to just 67 yards. They also applied consistent pressure on the quarterback that led to three sacks.